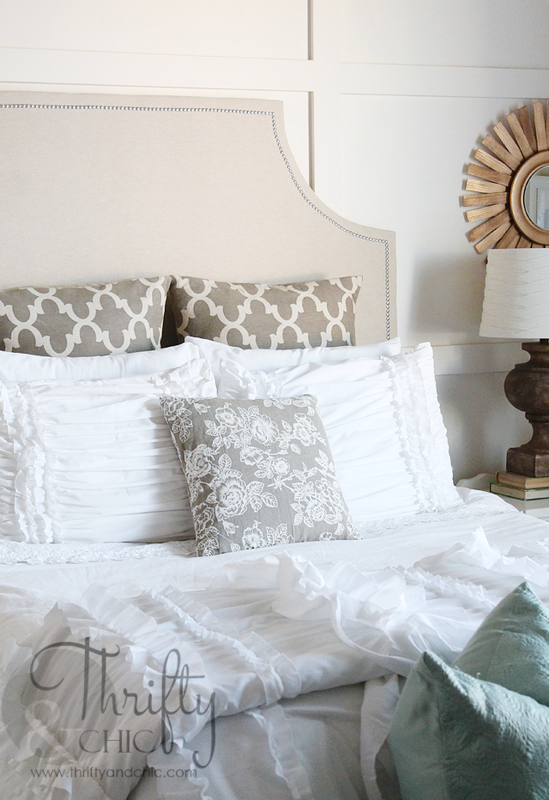 I'm slowly finishing up some projects in my master bedroom. It's sooo close to being done. I've thought it was done a few months ago, but then realized how much I needed storage. So more and more changes have come about. But, this headboard has been one that was sitting undone for months now. 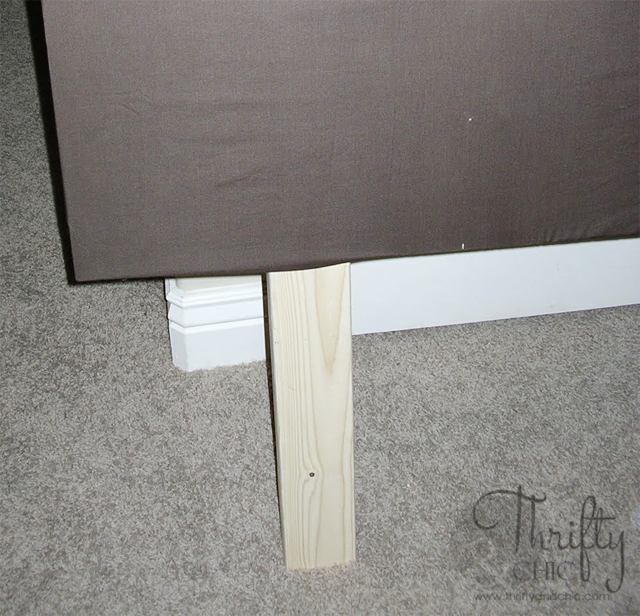 I showed you the headboard when I shared my Rast dresser Ikea Hack with you, but it wasn't completely finished. The reason? I just kept forgetting to grab the trim every time I went to Hobby Lobby. Lame. Yes :) lol. First, grab your plywood the length you need to cover the size of your bed and the height you want. 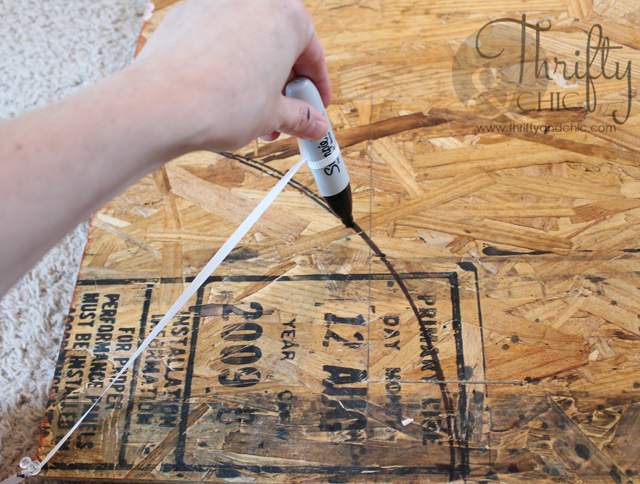 Then take the corners and grab a marker attached to a piece of string. 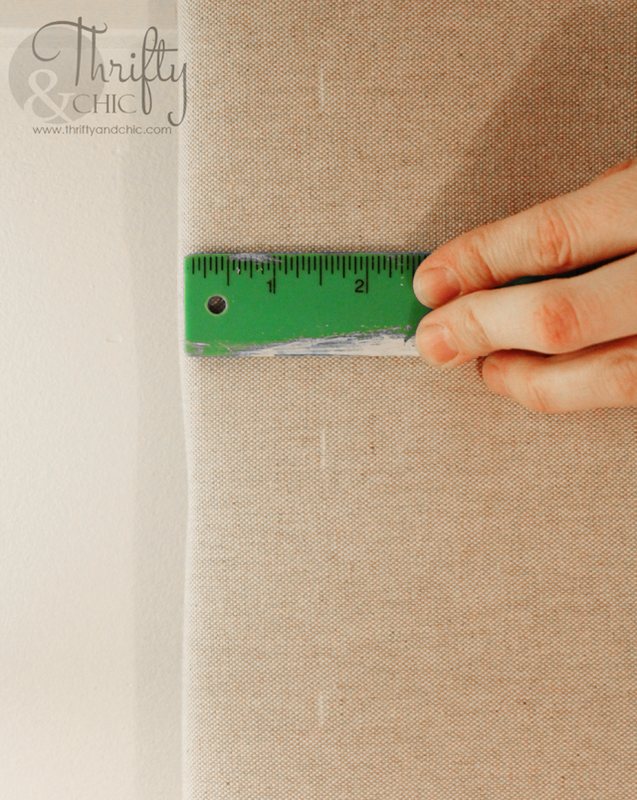 Put the end of the string on one of the top corners and then mark your curve. Do this on the other corner also. Cut out the curves with a jigsaw. 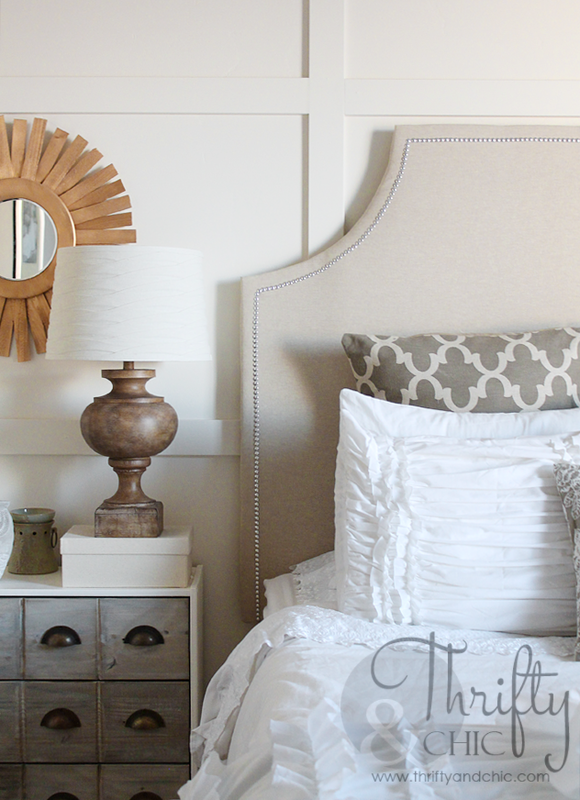 Follow the above tutorial for how to finish upholstering your headboard. It even offers a great trick on how to add the fake tufts. Most people wonder how I have the headboards stand up. I just attach two 2x4s on the back of the headboard. 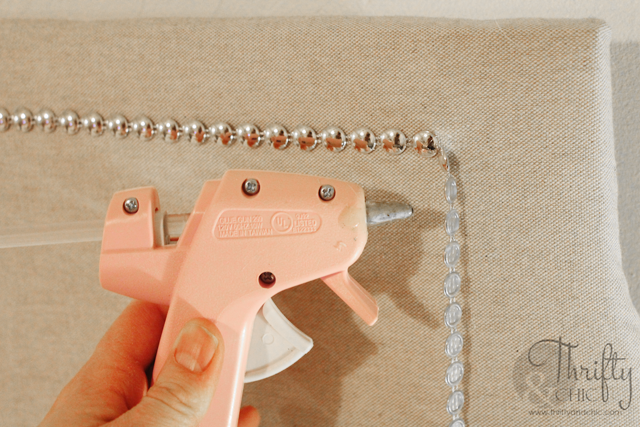 The best time to do this is at the beginning before upholstering since you will drill from the plywood down into the 2x4s. 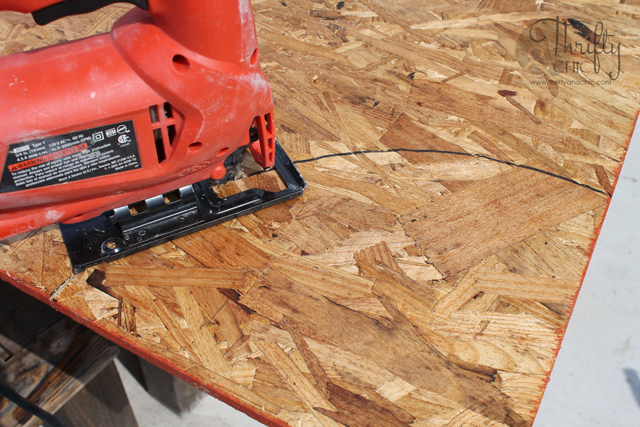 If you want to attach it to your frame, make sure the wood is measured in line with it and use a drill to make some larger holes for the bolts. Now for the trim. This trim is $3 or so a yard at Hobby Lobby. Get it with your coupon and it becomes way cheap :) I grabbed 4 yards for just around $7. I used a white pencil to mark 1.5" all around the entire headboard. This is going to be where the trim is placed. I then hot glued the trim all around the headboard. At the corners, I cut the trim and started the down or upwards line again. It just made for a smoother look. On most of the trim, I hot glued every 4th or 5th 'nailhead'. For the curves, it ended up being almost every other one, just so it laid down smoothly. Here's my almost complete master bedroom. I added a bench in place of the chairs since it has storage. I'll be happy and call it done when I finally get around to making the other Rast dresser that's been sitting in the garage for 2 months. Truthfully, when you are pregnant, things like that just don't rock your boat as much as they used too lol. The fabric I chose for the headboard was just a linen found at Hobby Lobby for under $7 a yard, then of course...I used a coupon :) I found a similar fabric at Walmart of all places for like $2.50 a yard only 6" shorter in width. 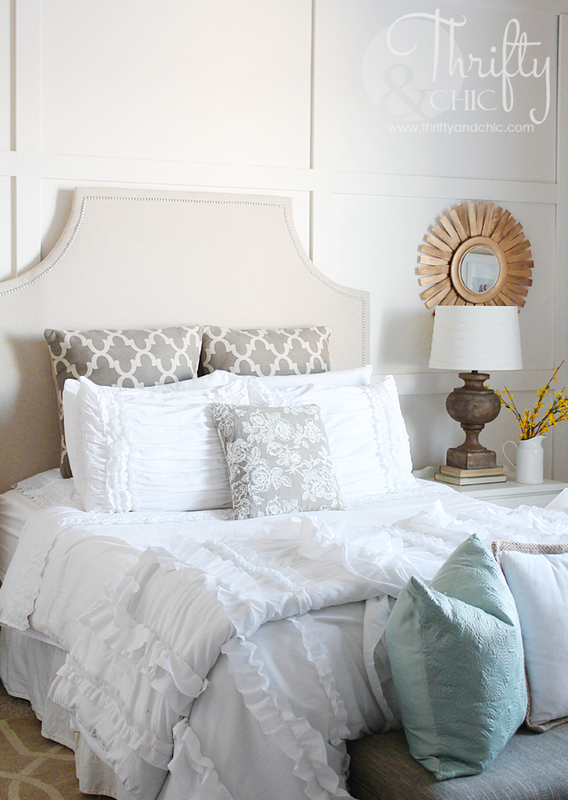 But if you are working with a smaller headboard, that would totally work. The trim also comes in 3 different colors. Chrome, like mine, brass and kind of an oil rubbed bronze. And it does come in squares also! 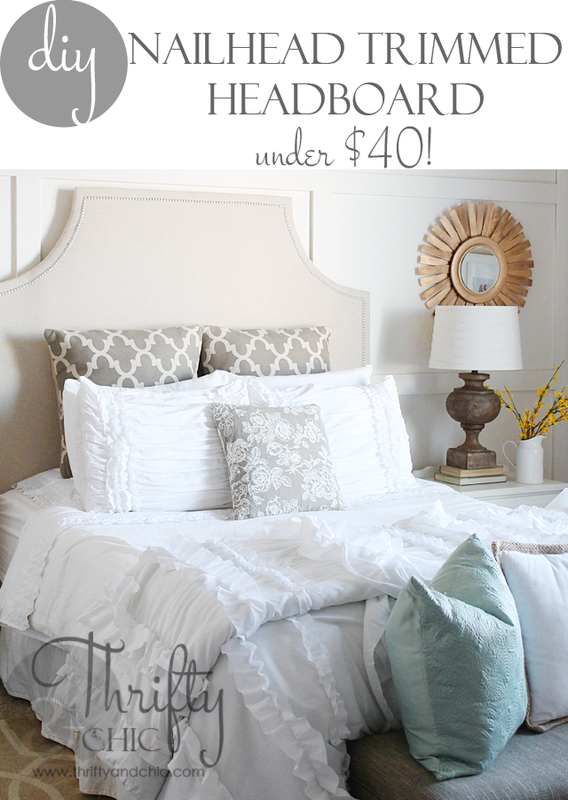 So, what is this headboard going to cost you? I love this! your bedroom is just beautiful. Everything looks great! It always feels so good when everything in a room really starts to come together. And I totally understand the whole pregnancy thing...tough to find the energy sometimes! Good luck! 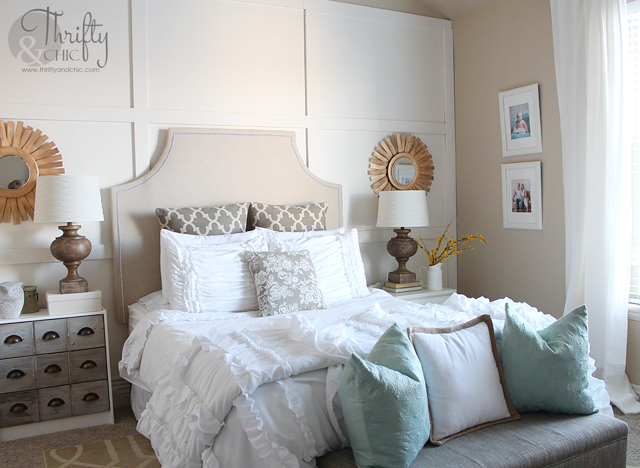 This whole room is dreamy, and that headboard gorgeous! 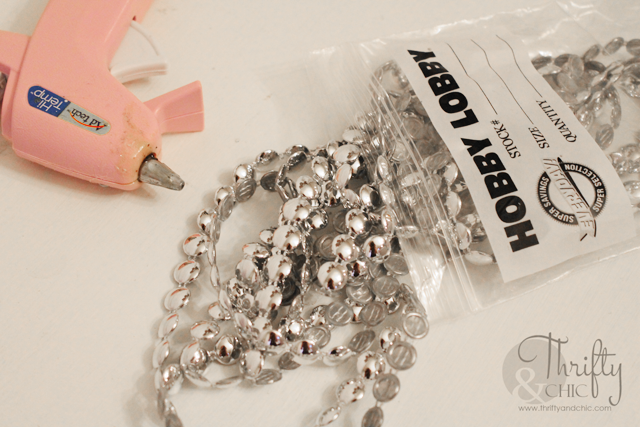 We'd love to have you link it up to The Creative Collection Link Party http://www.thecraftedsparrow.com/2015/01/creative-collection-link-party-9.html Have a super week. I just found your blog and I love it! I have one question. Where did you get your lamps in your master bedroon from? I am in love with them! What is the name of this trim ?